One thing you quickly learn growing up on a family cattle ranch, such as I did in the 1950s, is that beefsteak has a distinctive taste based on the geographic region where the cattle are raised and grass-fed. Judging by the number of people in the nook of Idaho between Montana and Wyoming that specifically sought a side of beef only from my dad, that taste varies even within a locality. I suspect the flavors specific to our ranch came from volcanic soils and spring-fed waters that had gathered tastes as they filtered for hundreds of years through rhyolite lava flows. 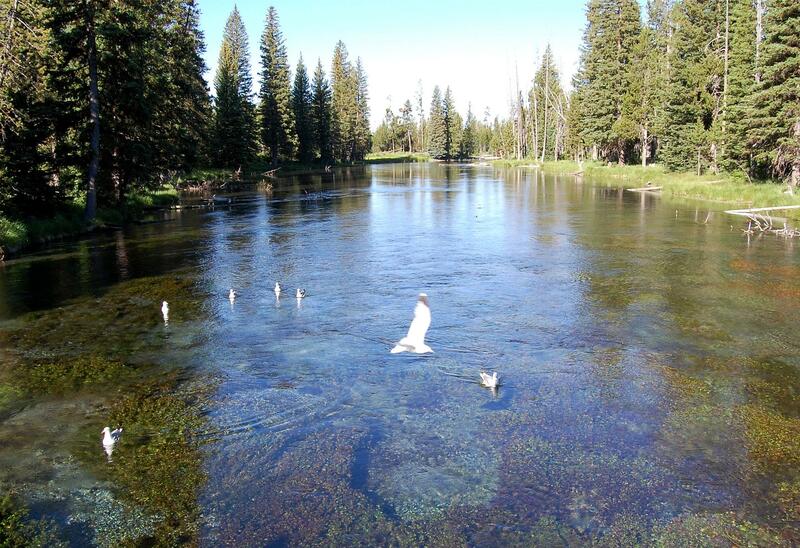 That water bubbled up from Big Springs (image shown below by Robert English) to form the Henry’s Fork of the Snake River and recharge groundwater where it was again filtered down through the nestled calderas of Henry’s Fork and Island Park created by past supervolcanic eruptions. It then emerges from the slopes of Big Bend Ridge onto the ranchland and meadows along its base such as ours. Further south, these same waters contribute a distinctive flavor and texture to seed potatoes which are then replanted much further south again giving Idaho its famous Russets, heralded on restaurant menus nationwide. Both our cattle and those potatoes are taste- and sense of place-distinct, just as are the Jersey Beef grown on Bull City Farm in Durham, North Carolina, long identified as one of the “foodiest” towns in the nation and where I have lived since the 1980s. Long before these terms were coined, “foodie” and “local-sourcing” emerged in Durham’s DNA. Newbies may misattribute their notoriety here to Downtown Durham’s resurgence, but quite the opposite, Durham’s long pre-existing restaurant culture, when transplanted, fueled that revitalization. “Local” plays a role in six of the top ten national culinary trends for 2014, including specifically ranch- and farm-branded produce, dairy and meats. Altering Durham’s DNA, beginning more than thirty years ago, Durham chefs led by Georgio Bakatsias (Bok-i-shaw,) Ben and Karen Barker and Mary Bacon began relying on local-sourcing and even hyper-locally sourcing meats, dairy, produce and seafood either grown in Durham or nearby including their own gardens. As they mentored, they also passed the importance of locally-sourcing foods to generations of other now-acclaimed Durham chefs such as Scott Howell, Amy Tornquist, Chris Stinnett, Phoebe Lawless, Matt Kelly and Billy and Kelli Cotter. But going back even further, locally-sourced food products can be traced back in Durham more than two hundred years to locally-grown grains milled at Cole Mill and West Point, as well as famed dairies such as Croasdaile and livestock growers such as Quail Roost. From the time it was formed twenty-five years ago, this uber-organic food scene was woven into every fiber of Durham’s overarching personality and appeal by its community marketing agency, and today it is viewed as much a part of North Carolina’s brand as its vaunted scenic beauty. Communities began to lose their distinctive taste when transportation enhancements resulted in food products traveling now an average of 1,500 miles before they reach our grocery stores or restaurants. One must also be extremely wary when the term “local” is used today which is often attributed to sources in a 500 mile radius. More than just semantics or attempts to encourage more sustainable practices, locally-sourced foods have tastes that differ even within a community. Foods sourced from northern Durham, for example, where many of its farms are located, will have gleaned the much older taste of slate. Any foods gleaned to the south of downtown are more likely to exhibit the influences of shale, accented by Trilobites, extinct marine arthropods. Yum, yum! Both Durham tastes are distinct from flavors elsewhere even within the same poly-centric sub-region such as those locally-sourced in nearby Raleigh or Wake County. Dining out is one of the two most frequented activities overall by visitors in the United States. Recent surveys show that 83% of travelers make it a point to experience foods specific to a destination. A destination’s locally-sourced food products will influence even the taste of recipes that aren’t distinct to a location. Food may not be exclusive to a community, but the way it is manifest can be as much a part of a community’s distinct personality and brand as its building materials or architecture or species of trees or heritage or indigenous events or scenic character. In the end, all local is hyper-local.